You are currently browsing the tag archive for the ‘accessability’ tag. I have mentioned recently that Portland Oregon in the US has for a while been my number one favourite with all things environmental in an urban environment. If it can be done & improves the livability of the environment, they do it. If it extends the life of a street tree, they do it. 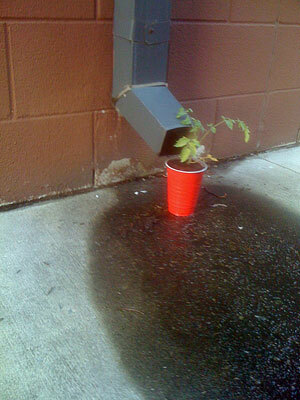 If it improves stormwater management, they do it. They also have what appears to be large community interest & involvement with a thriving community of volunteers across many programs that better the urban environment. Portland shows the rest of us what can be done. It’s ugly & not seen as conducive to creating livable cities. It’s bad for stormwater management. Hard surfaces increase stormwater, over-burden drains & carry large amounts of ground pollution to rivers, lakes & oceans. Impervious surfaces prevent much of the rainwater seeping into & refilling the groundwater table. Impervious surfaces increase the Heat Island Effect making our environment hotter than it needs to be resulting in increased power usage just to cool our buildings. Concreted surfaces have destroyed habitat & made whole areas unsuitable for urban wildlife. In some cases these kind of surfaces have disconnected people from the natural world. Some people see concrete as ‘clean’ & fallen leaves as ‘dirty.’ This creates a cycle where more & more trees in gardens & along streets are seen as pests & either removed or vandalized. Once the overall canopy is lessened, the Heat Island Effect grows, power use also grows, but what doesn’t grow is urban wildlife who has fewer places of habitat & food supplies. Paul Sheehan wrote the following for the Sydney Morning Herald in July 2009 – “You, reader, live in a primitive city. In a hundred years from now, the society we are building will look back & marvel at how little we really understood about the world we have constructed for ourselves. We are stewing in our own juices. Last Wednesday, a night of driving rain, I attended a seminar where more than 100 professionals, a standing room-only crowd, had gathered to learn about practical, cheap, achievable ways of stopping Sydney’s pot from simmering. These were not wide-eyed utopians. In purely parochial terms, the heating of our biggest cities is even bigger than the global warming debate. Because the rise in temperature is mostly & demonstrably caused by outdated thinking. The story starts on Observatory Hill, at the southern end of the Harbour Bridge, where weather records have been kept daily since 1860. What the observatory has recorded is a rise in the average temperature at the centre of Sydney from 20.5 degrees to 22 degrees. As Sydney grows, Sydney slowly heats. At last Wednesday’s seminar we learnt why – 27% of the surface of the metropolitan area is covered by bitumen, the black tar which soaks & retains heat & thus changes the city’s climate. People & local Councils have paved whatever they could since the late 70s. It was a movement of convenience as concrete is easier to drive on, easier to walk along & easier to clean with a hose. The main beneficiaries were people with a disability who need flat surfaces to get around & parents with prams. I believe we need to continue to provide safe & easy access for everyone & there is much need for improvement in this area. Just last month I watched a man in a wheelchair who was forced to travel along the road next to Petersham Town Hall with the cars because there were no wheelchair ramps on the high kerbs at all 4 corners of the cross road. There must be many such areas like this that make wheelchair travel dangerous & difficult. Leaving aside wheelchair & pram accessible footpaths & kerbs, many government authorities overseas think that concrete worship has gone too far &, because of the above negative effects, are rethinking their concreting practices of the past. Most car parks do not need to have concrete or asphalt/bitumen. They can easily be compacted permeable surfaces allowing stormwater to travel into the ground to the water table rather than into 100-plus-year-old drains. Permeable surfaces actually need less maintenance than do impervious bitumen surfaces & therefore are cheaper in the long run. 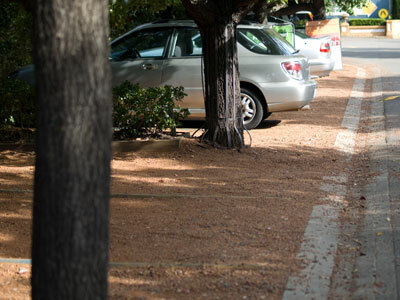 Appropriate trees can be planted within the parking spaces improving the visual outlook & also helping with stormwater & pollution uptake. Footpaths do not need to be wall to kerb, except in shopping strips where a greater use of the footpath space is required or where the space between building & kerb is unusually narrow. This was a very popular landscaping idea in the 1990's. 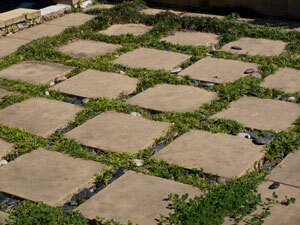 Cement pavers with pebbles or mondo grass in between allowed walking, but let the water drain away. 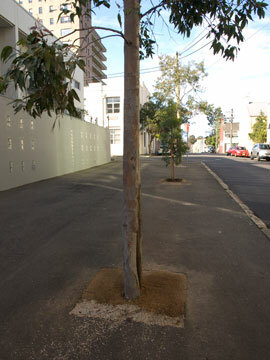 Marrickville Council is adept in building bio-swales & rain gardens. There is no reason why a small rain garden or two cannot be built within a car park if there is a reasonable flow of water from nearby buildings & from the lie of the land when it rains. I suspect these ideas will be dismissed in most areas of Australia as ‘too greenie’ because of the convenience of paved surfaces. However, in a few years depaving will be the norm because of the worldwide push to restore groundwater, lessen the Heat Island Effect, restore habitat & make cities more livable. Although many governments are stalling any real action on climate change, some overseas already depave, create green space & plant more trees in public spaces in cities because they know what is coming. It is like a slow culture change. Once we get used to these changes back to softer infrastructure, we will cope with the bigger changes of gravel lanes & fewer paved surfaces. If we can create a balance where people who require flat surfaces for mobility can have this, but remove unnecessary hard surfaces & green up, we will have a much cooler, prettier, more environmentally friendly & wildlife habitable environment to live in. It doesn’t take much to create a huge improvement on many levels.